That's the best I can do. I'm really terrible at this! Way cool, Mary. Thanks for the fun. That's not terrible. Claire is going to be jealous. ;) Yours is the first Doodle Week bug I have seen. (Not counting Claire's blog). I don't think I will get mine scanned until tomorrow. It looks cute ! I didn't participate because I don't understand very well what this doodle thing meant. I did not even have a time to try it yet. With the whole week of doodling at Mo's, I hope I'll play at least once. That is if my doodles will be publishable (lol). Great drawing. I think you missed your calling. That is a great doodle bug. Well I didn't even dare do a doodle, I'm that bad, relying on my writing instead. So it's ten out of ten from me. That's fantastic!!! It's fun isn't it? 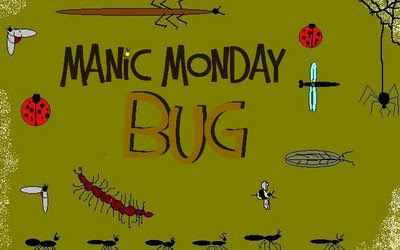 My bug is my first attempt too at doodling....hehe. Your doodle bug looks very happy! It's better than I could do! No, you're not terrible at this - the bug is sooooo cute!! !